With IT evolving into a key strategic asset for business success, CIOs constantly find themselves at crossroads in deciding if and when to venture into emerging technologies that are starting to shape the next generation data centers. Their challenge lies in traversing a maze of competing technologies and tools to choose from while avoiding hype from vendors in the creation of an adaptable, scalable and highly agile infrastructure that not only responds, on-the-fly, to applications ranging from OLTP, Business Intelligence/Big Data/BI Analytics, HPC to Streaming Media but gets implemented without disrupting existing IT processes to meet changing critical business needs. The IMEX Report on SDS 2014 provides guidance on various technologies: what they are, their hierarchical significance and strategic impact on the operation of next- gen software defined datacenters (SDDC) that is starting to completely transform in support of IT to run the businesses. IT managers often deployed servers, storage, and network equipment in dedicated configurations, application by application in an adhoc fashion. The resulting data center ended up consisting of isolated application environments with low resource utilization, higher cost, complex management and an inordinate amount of power consumption. The promise of software-defined data center (SDDC) stipulates on the emergence of an IT infrastructure architecture that leverages a set of new technologies to increase IT agility and speed delivery of new IT services and capacity to application owners while keeping costs down. · Resources are defined in software. Following stack is a typical representation of IT-as-a-service accessed on-premise or from a hybrid cloud that extends data center to public cloud. The nextgen Software Defined Data Center Architecture is based on the principle that by creating an agile, application needs driven infrastructure using industry standard high volume components, CIOs can dramatically reduce costs while increasing productivity and efficiency and addressing business critical mission priorities. 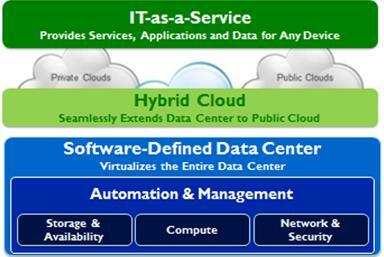 It provides a system-level framework that addresses data center demands for consolidation and business continuance in the short term while targeting Infrastructure Services and Application Services implementation to enable emerging Service-Oriented Architectures (SOAs) and On-demand, Software as a Service (SaaS) Cloud Computing technologies. Virtualization is a major disruptive technology of great transformational potential in delivering compelling benefits of significantly improving TCO and ROI in IT organizations since. 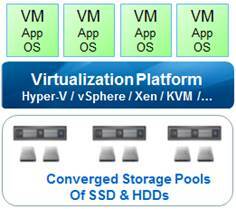 - Do for Storage like Hypervisor for Compute Virtualizes Storage for Optimum Mgmt. - Future Proofing to include future generations of Flash (3D NAND and NVMe) and High Speed Ethernet (10/40/100 Gbps) and Infiniband and low latency RDMA technologies. Despite the inherent and obvious advantages of SDS architecture in significantly improving both CapEx through ability use industry standard high volume components to lower costs and OpEx through automation to deploy storage efficient technologies, one of the key challenges for SDS lies in as to how to create a smooth transition from deeply rooted legacy SAN storage architectures into the modern SDS based storage infrastructure. Industry will follow a cascaded transition in stages over time from On Premises Storage to Public Cloud Storage to Public Cloud Centers hosted by Service Providers as depicted in the following diagram. IMEX Research‘s Industry Report on Software Defined Storage 2014 addresses the need to fully understand the directions IT industry vendors will take in formulating products to meet the need of the demands of CIOs and Datacenter operations.It enumerates a number of metrics for data center to achieve and provides detailed guidance for IT infrastructure vendors and IT decision makers (CIOs and operations managers) on how to optimally deploy compute, storage, intelligent information networks and software technologies that best support their mission needs through optimizing IT resources and business processes. what issues, opportunities, and threats do new SDDCs force as they evolve over next 5-10 years? 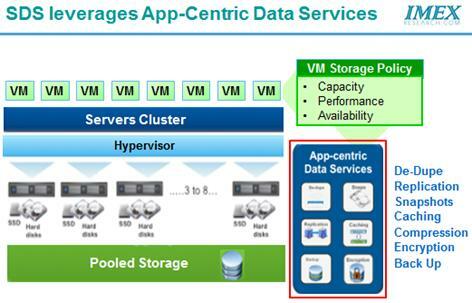 what are the technologies for the next-generation datacenter? 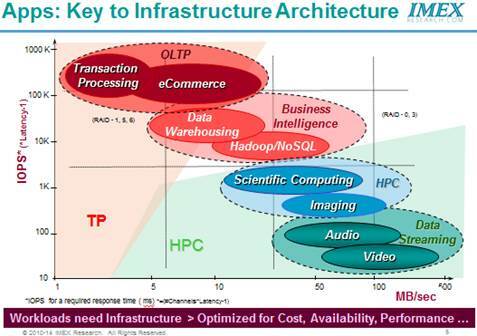 What are the datacenter infrastructure requirements? 10. Appendices – Methodology, References, Industry Links.